Since the last time I posted this, my post was immediately buried in an avalanche of more prominent posts, and nobody submitted a design, I’m going to try this again! We’re looking for designs to turn into Tee-Shirts, Buttons, and Stickers for giveaways(buttons and stickers) and sale(tees) at Pumping Station: One! 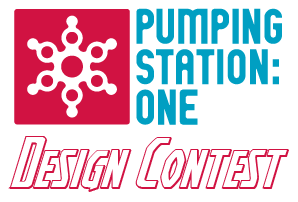 Draw, vector, and photoshop your heart out and show us what Pumping Station: One means to you! You can submit your entries throughout this month of September, with the deadline on the 30th. after that will be a week of member voting. The winning submission will get a complete set of the shirt (any size), sticker, and pin, as well as a “special meet and greet with the president of Pumping Station: One” (Bry asked me to include that last bit). Designs are for the tees, 1″ buttons, and 3″ stickers(round or square, depending on the chosen design). Unless you think the design will be optimized to look good in all three formats, I suggest you edit your designs for each application. By all means, have the same elements in each, but keep in mind that the button has less space for detail than the shirt. Unless you’re designing in vector format, make sure your original copy will be of sufficient size and detail. The canvas you work in should be about 10″ wide by 15″ tall and at LEAST 400PPI if not working in vector. Be excellant! No inappropriate themes. Remember that PS: One is a safe space, I know we have just f@*!ing do it as a central theme, but keep it PG or your entry will be invalid for the contest.